After a morning spent walking on all over Miami beach and Lincoln road, we went to the Design District, an up and coming area of the city, where we were meeting up with A’s brother and his family (who were also in Miami on holiday the same time we were) for lunch. The Design District is made up of streets and streets of designer shops and one-of-a-kind boutiques for interiors and home decoration. Here is where you’ll find Fendi Casa side by side with Marimekko and Poliform. In recent years, several fashion boutiques have opened here too – Christian Louboutin, Martin Margiela, Marni and even Tomas Maier. 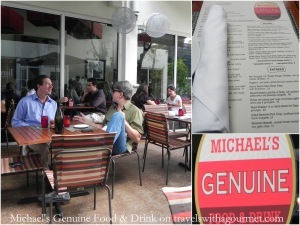 And where fashion and design go, restaurants follow and one of these is Michael’s Genuine Food and Drink. Set in a strip mall off the main road, the place looks unassuming and nondescript with some outdoor tables underneath large umbrellas. We get there at noon and killed some the time at the adjacent boutique Sebastien James where they have a fantastic men’s shirts. While A tried a few, I decided to pop in next-door and book a table and was pleasantly surprised to see that the place was already bustling with customer and it wasn’t even 12:30 yet. The interiors are similar to a bistro with booths on one side, a bar near the entrance and another smaller dining area behind the bar. The place was filled with business types and ladies who lunch which was a very good sign. I opted for an outdoor table so we could enjoy the warm Miami sunshine over lunch. We sat down early and waited for my in-laws to arrive over iced teas which also gave us time to study the lunch menu. There was quite a selection with several appetizers, sandwiches, pizzas, salads and a few heavier main dishes. When they finally arrived, we were more than ready to order. We skipped the starters and we all had large lunch salads while the kids had the burgers with homemade fries. As the rest of the drinks were served, a plate of soft, crusty sourdough was also set on the table. We hardly had time to catch up on each other’s news (the last time we all saw each other was in July 2009 in Marbella) when our plates arrived. 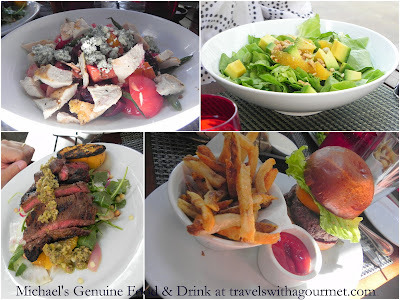 The portions were on the large side and were well-worth the reasonable prices (from $11 to $23 for the salads). A had the Harris ranch skirt steak salad – a hearty plate of grilled meat over grilled onions, radish, arugula, fennel and some olive tapenade; his brother R had the knife and fork Greek salad which was a deconstructed Greek salad of tomatoes, cucumbers, peppers, red onions and olives alongside a square slab of Feta cheese seasoned with oregano; his wife F had the butter lettuce salad with oranges, hazelnuts and avocados tossed in a shallot vinaigrette; and I had the colorful beet and heirloom tomato salad with chunks of sweet red and yellow tomatoes, beets, hearts of palm, string beans, blue cheese and walnut vinaigrette to which I ordered with some grilled chicken. We tucked in to our delicious and filling lunch – the flavors were simple with the fresh ingredients standing out and making the dish seem like home-cooked food, something that sounds disarmingly simple but quite hard to duplicate in a busy restaurant kitchen. We were about to skip desserts until we saw the menu and were tempted by the chocolate cremoso, lemon meringue tart and the homemade ice creams. The chocolate was a dollop of pure dark chocolate topped with sea salt and a drizzle of olive oil and sourdough crostini with a scoop of espresso parfait – the salt contrasting with the bittersweet chocolate and the coffee-flavored parfait. I had tasted something similar in a tapas restaurant in Barcelona and although interesting, the combination is unusual and elicits interesting reactions. My coconut ice cream came with swirls of chocolate and was served with some caramelized bananas, an orange sugared jelly and a cookie. 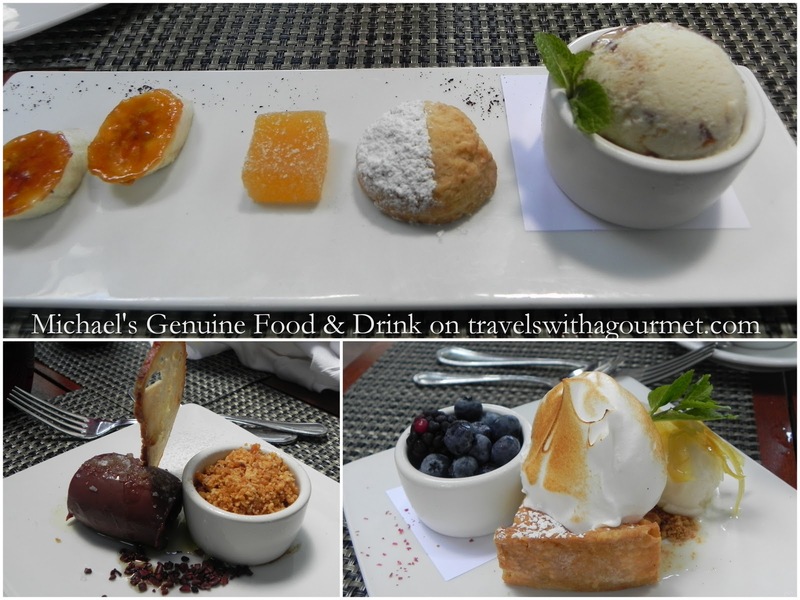 A‘s lemon meringue tart is one of the best we have tasted in years and it was so good that we had to order second one. Espressos ended our leisurely lunch and we wet our separate ways – us back to the hotel and them off to explore a bit of Miami. 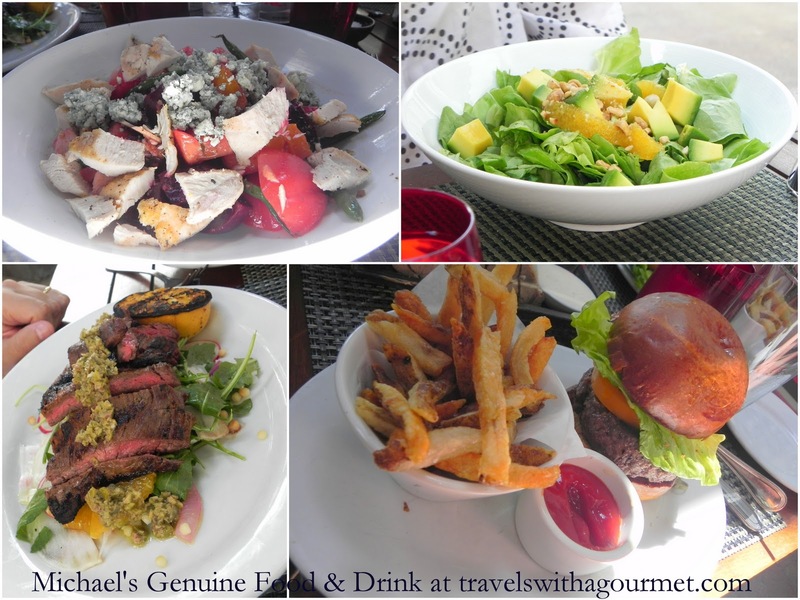 Michael’s Genuine Food and Drink is one of those restaurants that will go directly on my personal favorites list, an unpretentious place, aptly named and serving genuinely good food and drink at reasonable prices. It was my best meal in Miami by far.